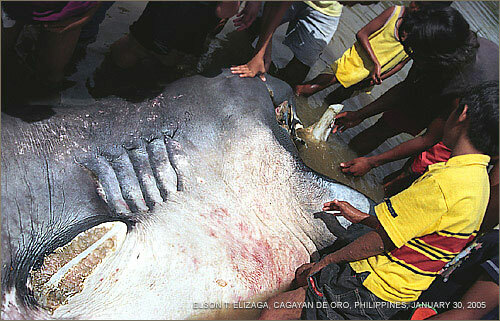 MEGAMOUTH 28 WAS CAUGHT IN THE NET of Sofronio Castañares [not Casañares as reported earlier] in Macajalar Bay, Philippines, around 3 am on January 30, 2005. The fish dragged Castañares' paddle-driven banca for about an hour, until it stopped, apparently exhausted. Castañares called another fisherman on a pumpboat to help him bring the fish to the shore of barangay Gusa, near the estuary of Bigaan River and Villa Ernesto Subdivision, Phase II. Initial reports indicate that Castañares sliced off the fins because he was upset that the fish had destroyed his net. Castañares hasn't been interviewed by this writer, however. Radio station Bombo Radyo reported the find early morning. Officials from the Bureau of Fisheries and Aquatic Resources (BFAR), City Agriculture Office (CAO) and several journalists came and made documentation. The shark was already heavily mutilated; its gender could not be determined. BFAR and CAO officials decided to bury the fish at the bank of the estuary, following Fisheries Administrative Order 208, which provides that the carcass of an endangered marine animal should be buried after documentation. BFAR and CAO officials, however, agreed with this writer, who suggested that the animal be dissected first to find eggs or embryos -- if it was female -- which could be preserved for scientific study. A butcher performed the dissection, with barangay councilor Prospero Abrio present as witness. See also report by BenCyrus Ellorin in Sun.Star Cagayan de Oro.